AS police and ambulance workers rushed to the fatal accident scene at Dreamworld, a priority call was made to police chaplain Fr Paul Kelly. Fr Kelly’s urgent help was required. He and other chaplains would be working shoulder-to-shoulder with the “first responders” as a crime scene was set up around the Thunder River Rapids ride, statements taken and next of kin notified. 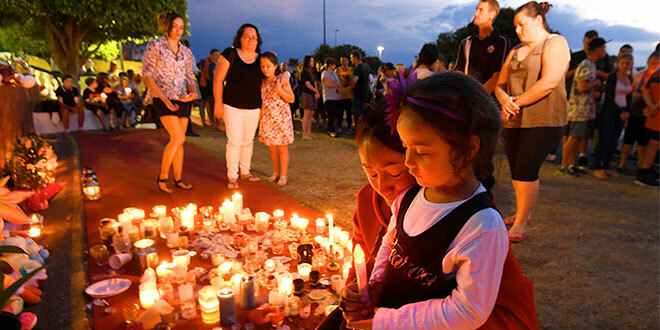 The Dreamworld accident on the Gold Coast on October 25 claimed four lives, and left families in anguish and shocked the public. And yet, what “happened” in the hours after the incident was never put down on paper, and did not make it to the official record. The work of a police chaplain is to be there – usually in the background away from the limelight of action – as a crisis unfolds. Even the most seasoned police officers need to process what they witness at an accident scene, and often they need a “good listener”. “You know the police chaplains are working when you don’t see them,” Fr Kelly said, stressing the anonymity he and his chaplain colleagues preferred in their work. “If you think you have seen a police chaplain, you probably haven’t. “The police have their job to do investigating. The chaplain role is to be there as a presence of support, either spiritually or emotionally. “We keep a very low profile in the background and only wear enough identification so that the police know who we are. At the coalface of police chaplaincy, Fr Kelly said the role was to serve, not preach. It is a ministry of support in the moment, and when the need arises. The first chaplain to reach Dreamworld at Coomera was Fr Kelly’s fellow chaplain, Anglican Reverend Charles Holmes, from Surfers Paradise. Rev Holmes arrived to find an anguishing and confronting accident scene. A police investigation team had already set to work gathering evidence around the covered bodies of victims. “When I got there it was important to talk to some of the witnesses because they were in a fair bit of distress,” Rev Holmes said. He set about doing what he could, back from the cordoned-off area, giving police space to do their job, and out of respect for a sensitive situation. “The cycle of grief – you never know where it is going to hit in the early stages,” he said. Rev Holmes linked up with Fr Kelly at the nearby Coomera Police Station where family members of the victims were taken to give statements. Fr Kelly said the chaplains’ focus turned to supporting a team of about 30 police officers as they began a long and arduous investigation. “It’s a time when nothing else can be done. The police are in there doing what has to be done,” he said. To maintain confidentiality, Fr Kelly said he wouldn’t disclose what, if any, chaplaincy support was needed. But he was full of praise for the high level of police teamwork he witnessed, carried out with “a quiet, respectful diligence”. “As you can imagine there is a lot of work just processing what has happened, to get absolute clarity as quickly as possible,” Fr Kelly said. “You don’t see something like this every day. I’ve always had respect for the police, but to see them in action in a big situation like this was really amazing. On the day after the accident, Fr Kelly and Rev Holmes joined social workers and counsellors as part of a police human support team, tasked with the ongoing support of police officers, their colleagues and their families as the Dreamworld investigation continued. “In this case, our presence, just being around and being open to chat has been gratefully acknowledged,” he said. “The next phase is when officers process what they have seen and heard,” Fr Kelly said. It is well documented that exposure to accident and crime scenes, and the stress of investigations take a toll on emergency services workers. They suffer an elevated rate of post-traumatic stress disorder, depression and suicidal thoughts. One in five officers are at risk of PTSD. Fr Kelly also acknowledges the ripple effect of suffering in the community caused by the Dreamworld accident. “This event has more of an impact on the community because it’s happened at a place quite synonymous with the Gold Coast. The community has all gone to Dreamworld; it’s a fun family place,” he said.